21 people said “no idea and I really don’t care”. It gets less important with each passing generation. You've hit the nail on the head.... As long as the pissants are fat dumb and happy.... Nobody is going to give a damn....That's the American way. It was almost 60 years ago. It really doesn’t matter anymore. Even if there was a conspiracy, everybody involved is dead or dying. It didn’t change anything and neither will “knowing” the “truth.” Historical events loose their impact as time progresses. Agreed. Now that GHWB is dead, I'm going to call this one a successful coup d'etat and a bonafide win for the conspirators. Congrats to all the LNer shills for all their decades of hapless work toeing the WC party line. Suckas! If it doesn't matter anymore.....Then WHY does the government continue to lie, and withhold evidence and information?? When was the last time the US gov even mentioned the JFK case? The "kids" don't remember where they were when they learned JFK, MLK, and RFK were assassinated. BTW, a reminder we aren't in Kansas anymore, Toto! WILLIAM BARR, U.S. ATTORNEY GENERAL: reviewing both the genesis and the conduct of intelligence activities directed at the Trump campaign during 2016. And a lot has already been -- a lot of this has already been investigated and a substantial portion of it has been investigated and is being investigated by the Office of Inspector General at the department. But one of things I want to do is pull together all the information from the various investigations that have gone on including on the Hill and in the department and see if there any remaining questions to be addressed. SHAHEEN: And can you share with us why you feel a need to do that? BARR: Well, you know, for the same -- well for the same reason were worried about foreign influence in elections we want to make sure that during a -- I think spying on a political campaign is a big deal, it's a big deal. The generation I grew up in which is the Vietnam War period, people were all concerned about spying on antiwar people and so forth by the government and there were a lot of rules put in place to make sure that there's an adequate basis before -- before our law enforcement agencies get involved in political surveillance. I'm not suggesting that those rules were violated but I think it's important to look at that and I'm not -- I'm not talking about the FBI necessarily but intelligence agencies more broadly. 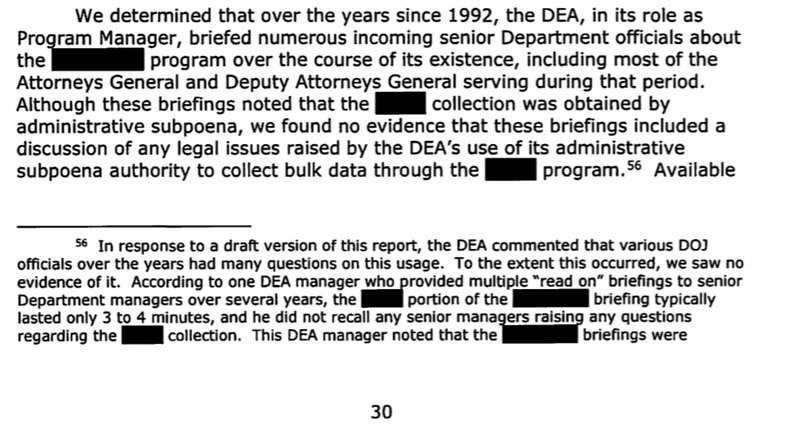 Mar 28, 2019 - Watchdog report critiques DEA program Barr approved 27 years ago ... a practice similar to the National Security Agency snooping program revealed in ... program back in January 1992: the attorney general at the time, Barr. 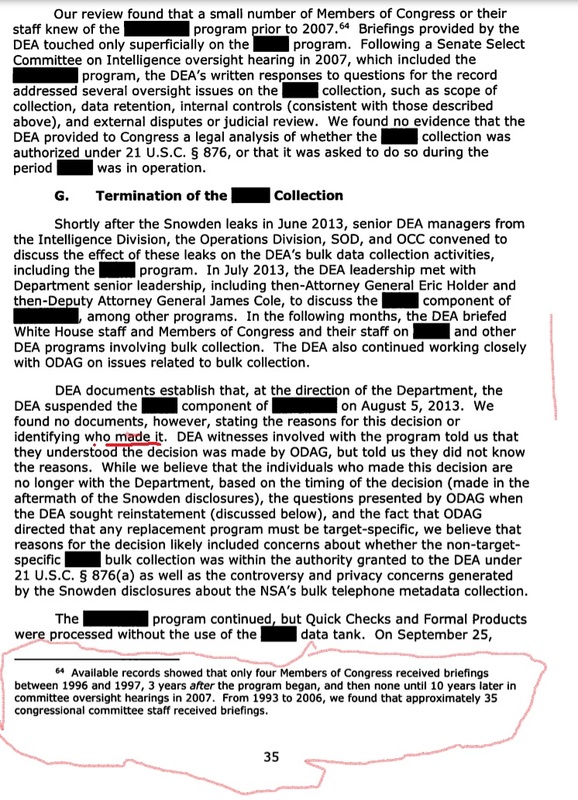 Apr 7, 2015 - The Justice Department revealed in January that the DEA had collected ... It was a model for the massive phone surveillance system the NSA ... The data collection began in 1992 during the administration of ... In 1992, in the last months of Bush's administration, Attorney General William Barr and his chief ..
SHAHEEN: So you're not -- you're not suggesting though that spying occurred? BARR: I don't -- well I guess you could -- I -- I think there is spying did occur. Yes, I think spying did occur. BARR: But the question is whether it was predicated -- adequately predicated and I'm not suggesting it wasn't adequately predicated but I need to explore that. I think it's my obligation. Congress is usually very concerned about intelligence agencies and law enforcement agencies staying in their proper lane and I want to make sure that happened. We have a lot of rules about that and I want to say that -- that I've said I'm reviewing this. I am going -- I haven't set up a team yet but I do have in mind having some colleagues help me pull all this information together and -- and let me know whether there are some areas that should be looked at. And I also want to make clear is not launching an investigation of the FBI. I -- frankly I'm, to the extent there were there were any issues at the FBI, I do not view it as a problem that's endemic to the FBI. I think there was probably a failure among a group of leaders there at the upper echelon and so I don't like to hear attacks about the FBI because I think the FBI is an outstanding organization and I think Chris Wray is a great partner for mayhem(ph). I'm very pleased that he's there as the director. So Bernie takes it up the kazoo at the convention and the Marxist in Chief spies on Trump and she STILL lost. I smell 4 more years coming. That is one putrid smell.